A new report on 2020 Democrat presidential candidate Beto O’Rourke’s marriage to real estate heiress Amy Sanders O’Rourke reveals the former Texas congressman indulged in some bizarre cuisine following his failed U.S. Senate bid in Texas. 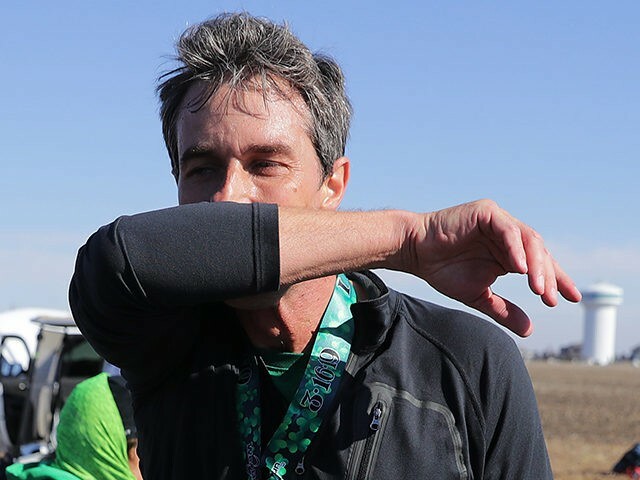 O’Rourke, who in January launched a five-state road trip across the Southwest, found himself eating dirt told to possess “regenerative powers” during one stop in New Mexico, according to the Washington Post. The newspaper said he also brought some of the dirt back home to Texas for the family to eat, as well. The strange antidote is one of several unflattering details to have emerged regarding O’Rourke’s past since officially launching his campaign last Thursday. In recent days, the candidate confirmed to Reuters that he was a member of a controversial hacker group the “Cult of the Dead Cow” while he was a teenager. He also admitted to penning a murder fantasy at 15-years-old in which he imagined mowing down children out jealousy for their happiness. O’Rourke was also forced to apologize on Friday for quipping during a campaign stop that he is only partly involved in raising his children. “Not only will I not say that again, but I’ll be more thoughtful going forward in the way that I talk about our marriage, and also the way in which I acknowledge the truth of the criticism that I have enjoyed white privilege,” he told the podcast Political Party LIVE! in Cedar Rapids, Iowa. On Monday, O’Rourke boasted his campaign raised more than $6 million in the first 24 hours. The “record-breaking” $6.1 million collected last week came “without a dime” from political action committees, corporations or special interests, O’Rourke spokesman Chris Evans tweeted. The figure is just above what Sen. Bernie Sanders (I-VT) reported for his first day as a 2020 candidate. O’Rourke raised $80 million in grassroots donations last year in his failed U.S. Senate race in Texas against incumbent Republican Ted Cruz. His early fundraising numbers in the presidential contest will be seen as an initial signal of whether his popularity during the Senate campaign will carry over to his White House bid. On Tuesday, O’Rourke is making a presidential primary campaign stop in Pennsylvania on his way from Ohio to the early voting state of New Hampshire. He appeared Tuesday morning at Penn State’s Hetzel Union Building for a meet-and-greet at the center of student activity at the school. O’Rourke is at least the third in the Democratic presidential primary mix to show up in Pennsylvania.